I admire the one sensitive to such an urge for it will encourage further growth and spiritual unfoldment but I began by saying that God is no respecter of persons, this energy will lift all regardless of where they are at .. As the energy shifts, so will each one of you from the level you are at..
As you diligently pursue spirit in each day you become better able to flow with the changes of energy and of spirit direction. You know that you can continue your course even as the swell sends you sideways. Only those who push hard against the current are depleted of their energies and stalled for the time being in their travels. If they allow the shift of the current to let them glide to the side they may continue to swim forward but this energy will assist everyone. WHERE IS THE EVOLUTIONARY PLANETARY ANU-MAL MAN TODAY ? Planetary dark Cabal's material over-control and enslavement of other humans, nature and planetary life are not the ways of God and His universe Laws. The time-tables of spiritually laggard dark Cabal planetary over-controllers are dramatically out of sinc and lagging behind the universe correcting ascending trends and are not realistic and are therefore irrevelant regarding the future sustenance of earth's human and planetary life. In order to sustain its human and planetary life humanity will be required to align with the rest of the universe spirit-mind and follow closely in action-realization the universe Teaching and Magisterial Missions Correcting Time leading advices and suggestions (see also www.Monjoronson.com, www.TMarchives.com , Papers and Q-A Papers posted on www.LighttoParadise.com). The below “Global clock” (click on the below reference) reflects minute by minute the current planetary state of affairs resulting from human abuse of the God's uni-verse evolutionary-creative process and His universe Laws. “Monjoronson: The greatest scar left upon planet Urantia is the fear of “great beings”, of “powerful people”. It was the plan of Michael to share in love all creatures with one another and this space would be one of everlasting trust to the degree that even the word trust would mean nothing, nothing more than the way things are. But the (Lucifer’s) rebellion infused the legacy of human development with the experience of malevolence from higher beings. Coupled with the chemistry and reaction patterns of an animal origin, human consciousness will react in a recoil fearful sense to supernormal manifestations. At issue is the presence of good and evil spirits and I bring in a third element, that being the human consciousness and its prior habituations and orientations. Because of the history of the human race even without the guidance of benevolent beings as was intended on your world, you have come to love God even with the many descriptions that are existent on this planet. But you also retain a wariness of a so called higher evil. Their power has been eliminated from this world. All that remains are the patterns of behavior in the human race. “It is timely to spend a few thoughts on Capacity. There is not a person on the planet today who utilizes their capacity to the fullest realization of their capabilities. Of course, that is not unusual on a planet such as this, which is so backward in many ways compared to other planets at their level of development. Other worlds have not suffered so many unfortunate upheavals in their evolutionary career. Here the planetary prince defaulted on his sacred promises to the Almighty God, and by his, and Lucifer’s design, brought this young and developing planet into darkness and sin. Henceforth it still struggles to become free, so the inhabitants can also break free from this suffocating darkness and start working towards their fulfillment of their God-given divine blueprint. There has been an over-much materialistic development and pursuit, and an underdevelopment and lip service to personal spirituality. The responsibility rests within each individual, meaning, the responsibility of the gift of free will and freedom of choice. How will you choose in life; for light or for darkness, for peace or for war, for happiness and well-being for self and others, or for increasing unhappiness? Remember that the power to choose free-willingly is always yours. This is entirely within your capacity, which is always enlarging according to the realization and understanding of what your responsibilities are. It is not in the sheepish unthinking following of some dogma or greed. No, it is in starting to ask questions and finding satisfactory answers that satisfy and nourish the soul, and a coming alive, and keeping alive, of your connection to the Power that Is. This Power is like energy, it flows everywhere in its everywhere-ness. It is accessible to all. What is standing in the way is lack of trust and faith. The capacity to have faith and to have trust has never been fully utilized as it is overshadowed by uncertainty and fear. Fear lurks everywhere, and people are being fed a steady diet of fear in the news media and the entertainment industry. 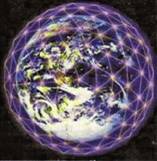 “Christ MICHAEL: … consider it’s the natural tendency of an animal/primitive nature to expand until stopped. Animals are territorial, and with humans this includes not only land but knowledge and religion--you’ve gone to war over disputed facts and beliefs. You develop in a certain direction until you hit a wall--figuratively speaking. You experience a limitation, and that is suffering. Hopefully you learn by the experience; you find a way around the limit by understanding it. Every individual has to recapitulate, not only as an embryo the evolution of planetary life, but as a child and adolescent the evolution of civilization. A little two-year-old is kind-of like a small cave man walking around, and when you thwart them…thank goodness they don’t have the power or hardly a parent would survive. This is the story here, and you are just pointing out the world is still only in the early stages of a planetary-wide united civilization. There was an enormous miscarriage of the divine plan, and everyone is still suffering the effects of that in the disparity I mentioned. Yet this can be overcome only one person at a time through the realization of free will fed by creative spirit. Never despair. 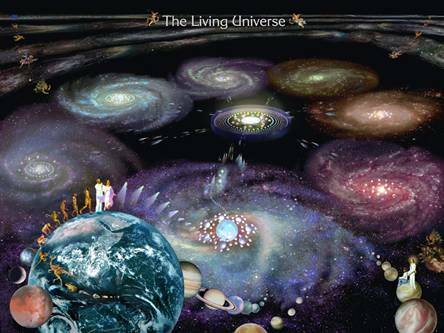 This universe was set up so individuals could learn, could take a hand in their own, progressive evolution. You are co-creating your own life. You are a creative part of this adventure. You are an active component of what you are experiencing. ...Where to begin? The essence of the Lucifer manifesto--which you can read for the first time in history, in your Urantia book--is the identification with what you’ve come to call ego, the self-reflection of the smaller part of your consciousness, devoid of true spiritual perception and humility. Ones ego does serve a valuable function of self awareness, but the elevation of this only partial aspect of a person’s being to supremacy was and remains a tragic mistake. Because you are, as well as Lucifer was, spiritual beings, there is a fundamental flaw in this identification, in this partiality, elevating the part over the whole personality, spirit, and soul--co-authored by a fragment of God himself. This leads to building oneself and ones empires on illusions, ego-generated illusions and desires of grandeur. True, enduring growth is elsewhere. To sustain the ego-feeling of oneself growing larger is difficult because you‘ve thrown away, disregarded, disenfranchised, refused to develop the most creative part of yourself. Instead of having an inner connection with your more absolute and transcendent self, your God-given unique personality and your soul, even the presence of God within you, you go for the outwardly and more temporal/time-limited, only relative power of being more powerful than your fellows. This is the essential flaw. It follows down to today right from the beginning with families, then tribes, then city-states and nations. There always have been those individuals who have acknowledged power within the family or tribe as well as in the inter-tribal/social competition for land, resources, ideas, Gods--ways of life. This is still going on. ...Secrecy--secret knowledge and ability is power, inherent in competition and warfare--in political power, so there always have been those smaller groups of men and women who controlled the larger group with whom they did not share their secrets. There always has been espionage--trying to ferret out the competition’s, the enemy’s intentions and abilities. Yet too there always have been saints, those men and women who gave their lives to their fellows, supported by their own inner strength of spiritual connection. This is another competition, between worldly power and spiritual power. What you call secret societies are not denied so much as accepted as a matter of course by way of real-politic notions that the relationship of nation-states is fundamentally one raw power, that war and the threat of war is really what determines their relative positions. It is generally accepted then that within each nation/state there are dozens upon dozens of levels of secrecy peopled by individuals who each have their own interests as well as collective ones: tactics and strategy..."
In the future Q-A Papers the energetics and fine-tuning of the evolutionary chakra system by the Salvington’s Four Beings and the Adjutant Mind Spirit circuits will be discussed.